Last week I made my feelings clear about “health food” stores and all of the organic junk food that they sell. I do love that these stores usually offer a wide variety (and high quality) selection of organic produce as well as a nice assortment of whole-grain products. But you still have to have your guard up when you are shopping because, as I mentioned, everything that health food stores offer is by no means “real food” approved. So what better thing to do than share a “cheat sheet” to help you navigate through all of that junk to find the good, wholesome, real food? I spent a great deal of time walking through our local Earth Fare store (the South Charlotte location) looking at every single product that they sell. I know not everyone lives in Charlotte (or shops at Earth Fare for that matter! ), but a lot of the products that they carry are sold nationwide. So what I came up with was an eleven-page bullet point list of every single item that you could buy and eat/drink from Earth Fare if you were following our real food rules. 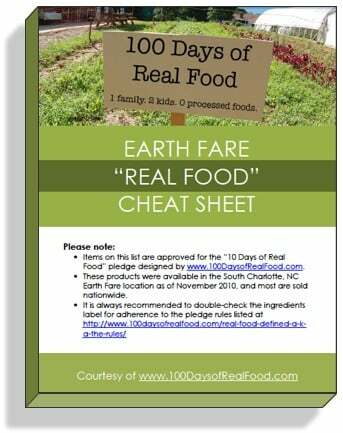 This document is the perfect “cheat sheet” for those taking the 10 Days of Real Food pledge. Oh how I wish I had this handed over to me when we started our 100 Days of Real Food pledge last year! his philosophy and his new book Texas Herbs. would you please e-mail me a copy of the supermarket cheat sheet? I am not on facebook. thank you so much, I love your webpage. Could you please email me a copy of the Supermarket Cheat Sheet? I’m not on FB…THANKS!! Hi Lisa, I am loving this idea. Could you please email me a copy of the supermarket cheat sheet as well as the menus that you have posted on facebook. I am not on facebook but I would love to participate. Also not on facebook…. Are you still e-mailing copies? I would really love to have one! Thank you!!! Hello! Would you mind emailing me the cheat sheet as I am not on Facebook? Thanks!! I am so happy to see a mother on the internet talking sense about what real food is and how to tell. Bravo! Hi Would you please email me the cheat sheet I am not on facebook. Thank you! I am not on Facebook but would really love to have this information. Could you email it to me? Your website is amazing and I am looking forward to cutting the processed foods out of our kitchen! Not on FB! Can you please e-mail me a copy of the cheat sheet? Thank you so much!! Please email this to me as I am not on facebook. I am so happy I found your site as we are moving to real food eating this year. Although the hardest thing for me to give up thus far is my soda and truvia in my coffee. Does truvia count as a sugar substitute if made from stevia plant? I’ve tried to look at several things on your website, and all of them direct me to your facebook page. I refuse to sign up on facebook, and wish this information was available to NON facebook users. I am not of FB, can you please e-mail me the cheat list? Thank you! I would appreciate a copy of the supermarket cheat sheet be emailed to me. Thank you. Just found your site, and will be back. I am not on FB. Please email me the “cheat sheet”. I am so excited to have found your blog! It is a wealth of information and such an encouragement as I try to prepare real food for my family…thank you for sharing!! I am not on Facebook but would love to have your “Cheat Sheet” if you are willing to email me one. Thank you for this! I shop Earth Fare along with Whole Foods. Could you please email me a copy of the supermarket cheat sheet as I am not on facebook. Is there a way to get this supermarket cheat sheet without being on Facebook? Can you email it to me? Thanks! Please email me the “cheat sheet”. I am not on FB. Thanks!! I am not on facebook and would love this via email. Thanks for what you do!!! I’m not on facebook either and would lve a coy of your “cheat sheet”. Thank you!!! HI i love al the information in your blog, can i please have the list emailed to me because i don’t have a FB thank you so much . I would also like to have the list emailed to me because I am not on FB either. Thank You. Would you please email me the Supermarket Real Food â€œCheat Sheetâ€. I also am not on facebook. It seems there are many of us who don’t care for Facebook. I would love to have a copy of this however. Just found your site and am loving it! Hubby and I watched a documentary called Food, Inc., which was an eye-opening experience for both of us. I had tried to go vegetarian before, but he has always been a real meat and potatoes guy. The documentary changed him. We haven’t eaten beef, pork or chicken since seeing it. We will, on occasion, have fish or seafood. Anyway, I am on a journey to cooking from scratch and trying to learn to select good foods to eat. A big project and one where you just don’t always know how to start. Plus, we live in an area with no organic stores :( We do have a farmer’s market though, but only from April to October. We are starting our 100 day pledge and would live a copy of the cheat sheet. I’m not on Facebook. Can you please email it to me? I love your website! Very informative! Sometime I feel as though I am the only college student on the planet without facebook, but it is nice to hear that there are other people out there without it. Would you mind also emailing me a copy of this cheat sheet. Thank you! I am so excited to get started with the chllenge! I will be cleaning out my cupboards and donating to the food drive this week. I too do not have facebook. If you can please email me a copy as well. I am brand new to this. Thank you.. I also do not have a FB account. Would you please email me a copy of the cheat sheet? I live in Dallas and we shop at Whole Foods. Just wanted to say I love your site and it seems like a great resource. Also wanted to encourage all these people asking for an emailed copy of the cheat sheet, to go sign up for facebook. It would likely take all of 5 minutes, and you don’t have to ever use it again. If you go to facebook and “like’ this site you are helping others to find this site that just happens to be offering you FREE resources. Seems the least we could do. Could you email me a copy of the whole foods cheat sheet? I’m not on Facebook but would love to have the cheat sheet. Thanks! Could you email me a cheat sheet? I don’t have Facebook! I’ve resigned from Facebook–too stressful and time-consuming. I’d rather cook! I’d love a copy of the cheat sheet via email. Thanks so much! May I please have a copy emailed? Cannot find this on Facebook either. Please email it to me. Thanks so much!!! Not on FB – could you e-mail me a copy? Thanks!! Not on FB either, I love your website and refer to it often. Please email a copy to me if you could. Thanks! Unfortunately I don’t have a Facebook either, do you think you could email me a copy of your cheat sheet? Thanks so much! I am so anxious to make a change. I don’t really know where to start and would love to review this document. However, I don’t have a FB page. Is there anyway this can be emailed to me? Thanks!! Hello! Is there anyway I’d be able to see this list? I’m not a Facebook member. I’ve switched over to real food for a few months now and I did a walk through of my local Whole Foods store yesterday and took pictures of all the products we’re able to eat to make it less time consuming when we go grocery shopping. I really appreciate your website and all that you do for the public! :) You’ve opened my eyes and changed my life entirely! Thank you!! Hi! My family just started eating real food 2 weeks ago! So far it has been great except our store exsperiances! It is so overwhelming! I couldnt get the cheat sheet to work for me on facebook is there any way I can get a copy emailed to me? Hello! My siser told me about your site and I am very interested in bringing your philosophy into my own home. I’m not on facebook though :( Would I be able to get a copy another way? I am not on FB. Would you please e-mail this to me? Thanks! I have to say I love this blog! Its informative, creative and has great recipes and suggestions on how to eat clean but not require perfection. LOVE IT! I have to say though, I am about sick and tired of every forum including this blog pointing me to facebook to get more info. I’m not going to join facebook EVER. I have no problem with social media but seriously, I think you alienate a whole group of people who enjoy, and want to protect, their privacy. Thank you. And I’d like to share that it took a great deal of time and effort for me to create these documents so in exchange for giving these resources away for free I ask for a simple facebook “like”. For all those that don’t use facebook and politely request the documents be emailed to them we have happily complied. i have just come across you website and feel like a weight has been lifted, i have been stressing about how to feed my family since my income has reduced by half in the last couple of months and i honestly did not know where to turn, i live in the UK so some of the information is not relevant (unfortunately) but i will take as much as i can from you expertise. Also, thank you so much for providing blog! Inspired by your blog, my family has been eating real food for about a month now, and we feel fantastic! We have loads more energy (no afternoon and evening energy slump, yay! ), I’ve stopped having migraines, and my husband’s depression has improved, not to mention we’ve both lost some weight. Meal planning and dinner prep used to be such a chore, but now it’s my full-blown hobby. I love using your recipes as they always turn out great (recipes must be well-tested by you before posting). I have such a feeling of satisfaction providing healthy, wonderful tasting food for my husband and two-year-old daughter. Thank you, thank you! I’m sure you scope out the blog scene for real food ideas, so here’s some blogs on which we’ve found some helpful real food recipes: Mel’s Kitchen Cafe (quinoa patties–yum!) and Green Plate Rule. I love the Earth Fare cheat sheet butI do have one question. I’ll admit that I do not know much about meat or buying meat. Are any of the Plainville Farms pckaged meats (Chicken, ground turkey, etc) okay? The package states “vegetarian fed, no growth hormones, etc) but I am not sure it meets your “local” criteria. I noticed Hershey’s Cocoa is on your Real Food Cheat Sheet. I was recently researching cocoas, and they are now also being contaminated with GMO’s, so it’s best to write to the chocolate company you most frequently buy from and ask them directly. Also, the more I research canola oil, soy, tofu etc., the more I have come to understand that soy-based products touted as health food is one of the biggest scams in the food industry, including organic soy products. The difficult thing is canola oil is in SO much of our food now and very hard to avoid. We are trying to eliminate it as much as possible. Canola oil seems to be in all salad dressings, but it is quite easy to make your own vinaigrettes without it that taste just fine. Hi I just found your website last night while searching for ways to begin getting my family into a clean eating lifestyle. I really am interested by all of the receipes that I have found and am looking forward to introducing healthy living to my girls. Thanks! Are legumes, canned or dried, a whole food? I didn’t see it on any of your lists. I was wondering what you think is more healthy, store bought wheat bread or homemade bread made with all purpose four? Hi Heidi. That’s a tough call because we avoid refined white flour as well as all the chemical ingredients in store bought “Franken-bread” though you can find high quality, low ingredient bread such as Ezekial. :) Personally, however, I’d choose a piece of homemade white bread over most store-bought breads. Can’t get to free guide/cheat sheet. I signed up for 10 day pledge starting Feb 19th and need it, please. I have used some of the recipes in the past while living in Honduras. Love the granola. Hello, I am very interested in the grocery cheat sheet. I just can’t seem to find it on the facebook page. I would love an emailed copy to [email protected]. I really appreciate what you are doing here on your site. I am slowly revamping my family then hopefully AMERICA!! !